A professor publishes Korean version of 'Taekriji' of Joseon era. November. 07, 2018 07:25. by Jong-Yeob JO jjj@donga.com. Ahn Dae-hoe, a professor of the Department of Korean Literature in Classical Chinese at Sungkyunkwan University, has completed an original version literature of Taekriji written by Lee Jung-hwan (1690-1756), by gathering different versions of the book to publish it in a unified Korean version for the past seven years. In an interview in his office at school, he explained about Lee Jung-hwan’s remarks. The scholar in the Joseon Dynasty said that there was no place to live in the country, for which Professor Ahn explained that Lee was deeply frustrated by bipartisan divides among noblemen and nationwide social status discrimination. Lee, who was originated from high-class family, was embroiled with an incident where politicians of Old Doctrine tried poisoning King Gyeongjong, which led Lee to be tortured and exiled from the political realm. The book Taekriji, written in 1751, is a classical literature of humanities and geology dealing with the country’s geological events. Most of the translated versions of Taekriji have been based on Choi Nam-sun’s Taekriji, edited and published in 1912. Choi's version, however, includes typos and stories, which were added later. Even some parts of the version were edited by the author from a nationalist perspective. “Only one or two typos can distort original meanings. 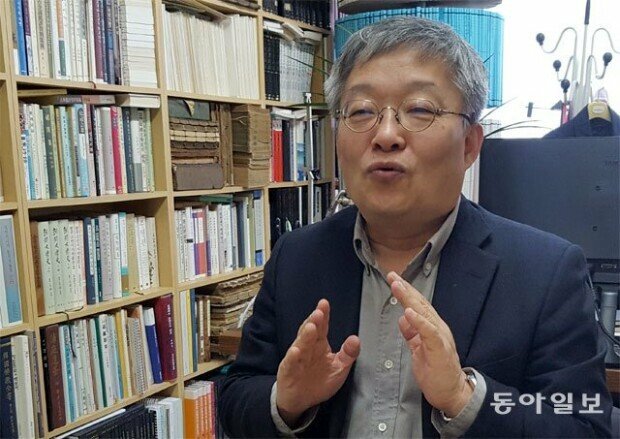 In Korean literature, making an original version is the foundation and the root for researchers to carry out their studies," said Professor Ahn. "It is no different than a house built on the sand." Doctoral candidates in the professor’s lab participated in the work to make the original version. They studied the high-class families in each region mentioned in the book. Taekriji serves many purposes such as a political doctrine statement, an economic geological publication, and a travel guide. The author believed that living standards include the existence of a place when war breaks out. His idea might have been the result of traumatic experiences with the Japanese Invasion of Korea in 1592 and the Manchu War of 1636. People today complain about their lives, hoping to emigrate due to conflicts, discriminations and inequalities. Lee's message can relate to today’s people in that he talks about the concerns over realities of his time and the need to reform.